WS-REST 2011 was held at the WWW2011 Conference in Hyderabad, India, on March 28, 2011. 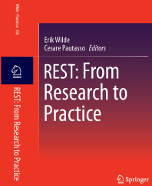 The WS-REST 2011 proceedings were published in ACM's International Conference Proceedings Series (ICPS) and are available in the ACM digital library and DBLP. WS-REST 2010 was held at the WWW2010 Conference in Raleigh, NC, on April 26, 2010. The WS-REST 2010 proceedings were published in ACM's International Conference Proceedings Series (ICPS) and are available in the ACM digital library and DBLP. WS-REST 2012 Proceedings have been published in the ACM digital library.